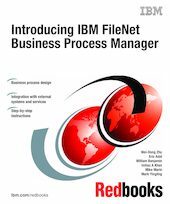 This IBM® Redbooks® publication provides a basic introduction to IBM FileNet® Business Process Manager (BPM) V4.0. BPM enables organizations to create, modify, and manage content centric business processes. One key advantage of BPM is its ability to work with active content, which refers to the ability of content to trigger or affect business processes. In this book, we cover the key elements that make up a business process, including tasks, participants, roles, steps, routing, and deadlines. We describe how to use Process Designer (a BPM application) to design your business processes. In addition, we provide step-by-step instructions on how to implement a use case business process scenario. BPM also supports integration with external systems and services through Component Integrator, Web services, and Rules Connectivity Framework. We discuss these integration options and provide instructions on how to implement the use case scenario by demonstrating some of the options. This book is useful for system architects, process analysts, and process designers who require an understanding of IBM FileNet Business Process Manager. It also serves as a practical guide for those who want detailed instructions in order to implement a BPM system.